greetings, I'm still here, still eating interesting food, I'm just crazy tired from a long week and some early spring cleaning (not that I can see my desk yet, but hey, it's been a busy year). I really really REALLY need to get the backlog of treat reviews out of my brain. They'll probably be a little short and to the point, but better to get them out there then lose them forever. I think there are 4 (or is it 5) wedged in my brain. In the meantime, check out the list of limited flavors over at the Turkey Hill blog. I was going to do a post about it, but now I don't have to. You have to try Box of Chocolates when it comes out! 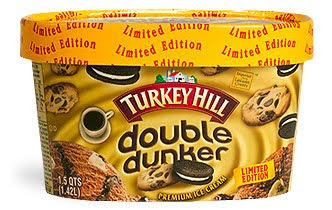 Also, I may not be big into mocha and coffee, but man am I tempted by "Double Dunker". I'll have to keep my eyes open for that one. Hmmmm, I wounder why they didnt bring back Peanut Butter Brownie? I recently tried this ice cream and it was fantastic! However, it was only available in the pint size. You rarely fine mocha flavored ice creams, but this one truly hit the spot!